While the zirconium bridge is a wonderful dental advancement, you may not be familiar with what makes it so special. A zirconia bridge is designed in a similar fashion as the All-on-4tm permanent teeth replacement or screw-retained, implant-supported bridge, but with many more advantages. First, it is made from Zirconium oxide, an extremely strong form of dental ceramic. 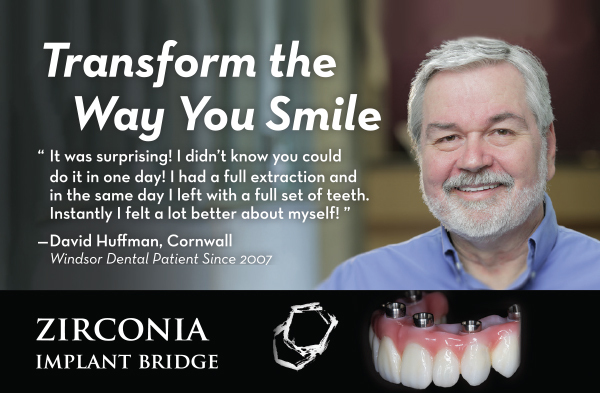 Zirconium oxide is compatible with the human body which means you won’t have to worry about any negative reactions to the bridge. Those who may have had an allergy to metals used in other types of bridges need not worry – there is no metal used in a zirconia bridge. Zirconia bridges are also exceptionally strong and stable. They have a translucent appearance which provides a more natural match to your existing teeth. Since there is no base metal, black lines at the edge of the gum line are eliminated. While you may have many options regarding the type of bridgework you would like to have, a zirconia bridge is one of the best. You will love your appearance, will experience less tooth sensitivity, and will have a more natural look to your bridgework. The most common thing a patient says after receiving this permanent solution to missing teeth is, "I should have done this procedure many years ago!"